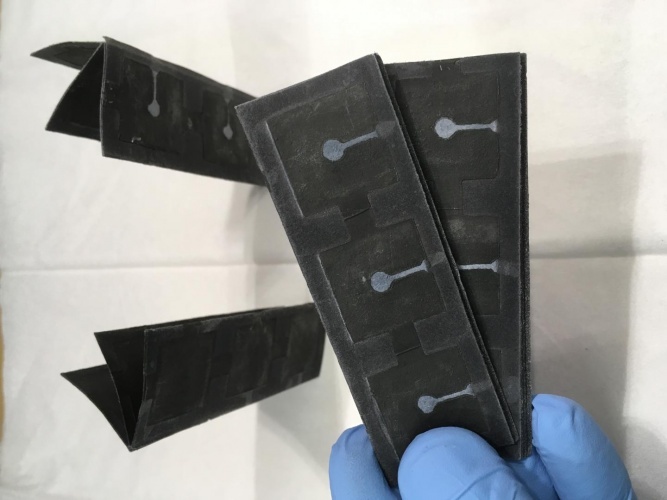 Researchers at the State University of New York, Binghamton have created a biobattery made from paper that uses bacteria as its power source. In remote parts of the world, access to batteries for medical devices and diagnostic equipment is often limited. Paper-based biosensors have long been used in these environments, but without a power source, they generally lack the sensitivity to provide accurate results. In light of this, the researchers went in search of a low-power bio-based alternative that could power these sensors and other IoT-connected devices. To create the biobattery, the team first printed thin layers of metals and other materials onto a paper surface. For the power source, a quantity of freeze-dried bacteria known as exoelectrogens was then added. Exoelectrogens transfer electrons outside of their cell membranes as the bacteria produce energy for themselves, activated by water or saliva. As the electrons pass through the paper to the electrodes, enough power is generated to run a calculator and an LED. The team found that oxygen slightly diminished the power output, but as the exoelectrogens were tightly packed next to the paper, the effect was minimal. The biobattery, which is designed for single use, has a shelf-life of around four months. Choi and his colleagues are currently working on new methods of treating the bacteria to extend the survival and performance of the device. “The power performance also needs to be improved by about 1,000-fold for most practical applications,” he said. Choi has applied for a patent for the technology and is looking to commercialise the device with the help of industry partners. Trevor Bayliss, of happy memory, may have a word to say about this?